We sometimes feel we’re to blame in some way for what our gram’s become. She used to be quite happy here until she started on the crochet. Now she can’t do without it. Twenty balls of wool a day sometimes. And if she can’t get the wool she gets violent. While the above statement was said more than 30 years ago on an episode of Monty Python’s Flying Circus, it rings just as true today. 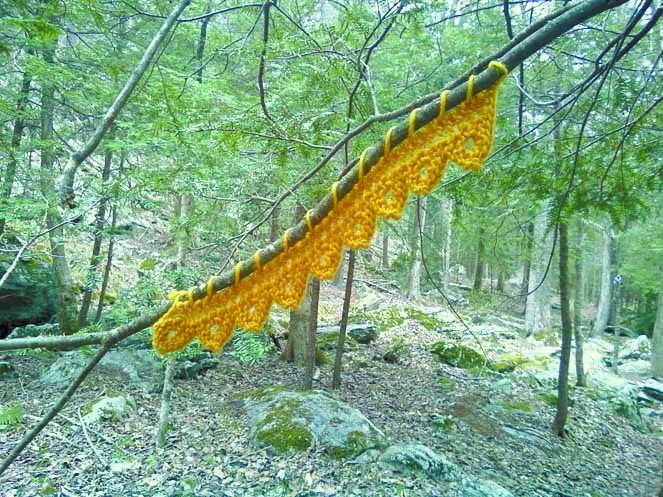 One of the yarn bombs found in a Connecticut nature preserve. Fortunately, authorities got to them in time and cut them down before any harm was done. Someone, we don’t know who, but clearly someone with a serious crocheting and knitting habit, has been terrorizing a land preserve in Weston, Connecticut, as reported in The Weston Forum. The culprit and accomplice (Miss Daisy requires a driver), are leaving their unmistakable tags everywhere. Well in a few spots anyway. The vandals arranged four pink, gold, and green crocheted cozies to look like yarn caterpillars on tree branches at the reserve. Not content to just quickly dump their wool and run, or amble slowly away with their walkers, these derelicts spent their sweet time carefully attaching their crocheted creations, loop by colorful loop, over the branches. 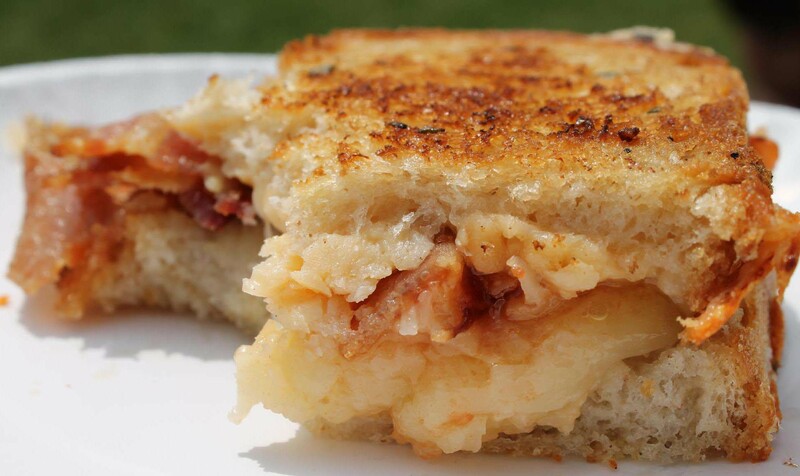 The Weston Grilled Cheese in all its glory. 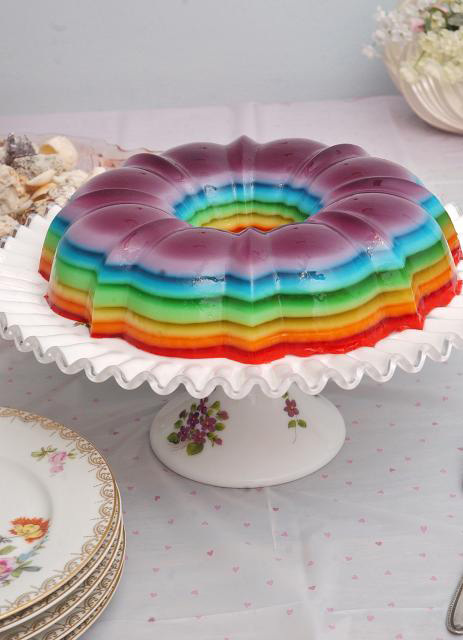 If I bring a Rainbow Ribbon Jell-O Mold to your home, it means I love you. It only has three ingredients, one of which is water. But like The Gates and other ephemeral works of art, as discussed yesterday, the sum is equal to more than its parts. You won’t see lattes and cappuccinos at the local Starbucks that look like this. 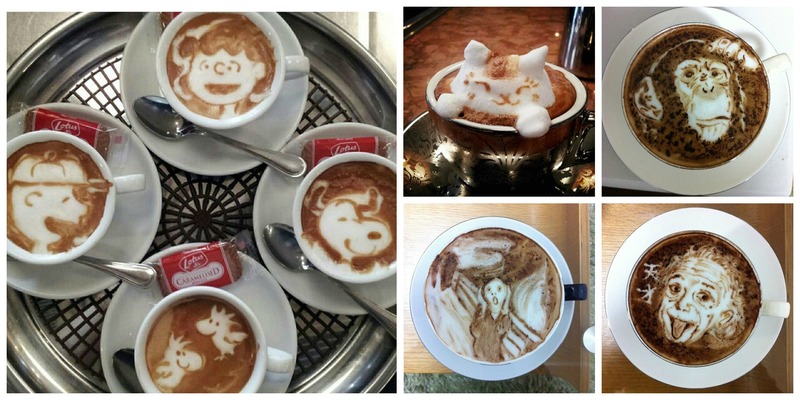 Playing with their coffee, instead of drinking it, Japanese latte artists Kazuki Yamamoto and Kohei Matsuno, are creating some cool, yet very ephemeral art. In the samples above, I’m especially fond of The Scream, Einstein, and of course the special 3D Latte Kitty which I referred to in my previous post about bridges. My name is Patricia and I am a Gephyrophobiac. Tomato Jam. It’s what’s for lunch when spread on a Grilled Cheese. I’ll be cooking two Grilled Cheese sandwiches — The Three Cheese Crisp, and my new creation which I’ve named The Weston, after the lovely Connecticut town I cover for my newspaper. I’ve gotten to know and admire many Westonites in the past eight years, so this is a little something in their honor. But this recipe isn’t carved in stone — yet! At the cooking demo, I’m going to try a few variations and see what people like best. After all, I’m naming it for them. I’m considering adding fresh rosemary to the butter, omitting the Smoked Gouda, possibly adding a crumbled Parmesan Crisp. Stay tuned! 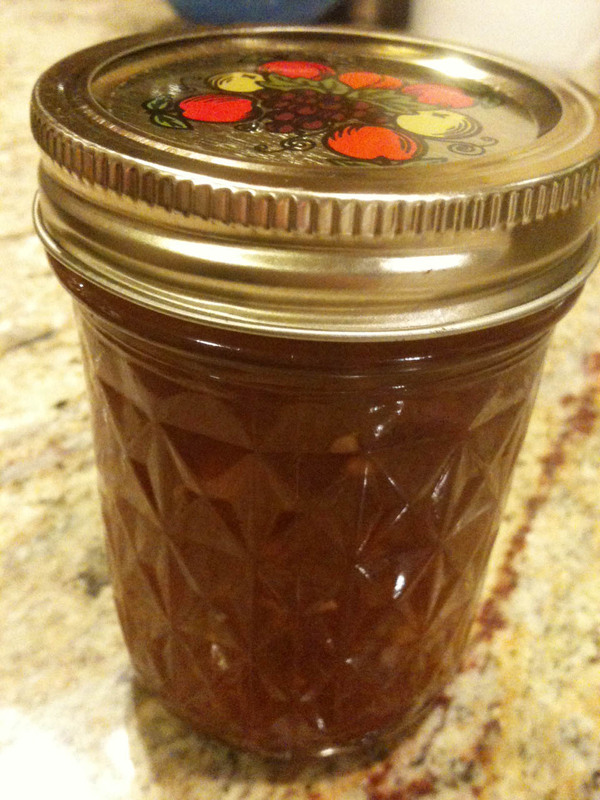 Here is my recipe for Tomato Jam, a key component of The Weston. If you love Downton Abbey (and let’s face it, you either love it or you haven’t seen it), watch this very clever and lovely “Sneak Peek” of Episode One of the upcoming season, staged at 54 Below in New York. 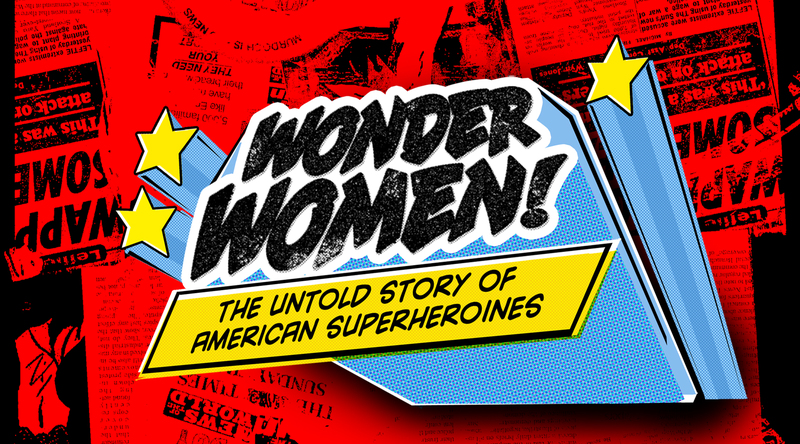 Kudos to writers: John Walton West, Jason Michael Snow, Greg Monteith, Kevin Duda, Lisa Lambert, Simon Pearl, David McCall. Performers: Christina Bianco, Jane Blass, Ron Bohmer, John Bolton, Catherine Charlebois, Alison Cimmet, Lewis Cleale, Rick Crom, Matt Doyle (fan favorite), Kathy Fitzgerald, Randy Graff, Jeremy Jordan, Mike Kelton, Leigh Ann Larkin, Christiane Noll, Laura Osnes, Jane Pfitsch, Tory Ross, Brian Sears, Tony Sheldon, Craig Schulman, Jennifer Smith, Elizabeth Stanley, Mary Stout, Tony Tillman, Rosie Colosi, Nikka Lanzarone, Adam Lendermon, Jess Patty, Nick Spangler, and Ryan Worsing. This is BRILLIANT! So good, I’d really like to see this production! For dentists that’s no good. At the risk of sounding like Andy Rooney, have you ever had a really bad toothache on a Sunday only to find out that there is no emergency dental care available? Why is that? That was me this weekend. Saturday night I suddenly got an excruciating pain in a lower back tooth. Nothing would stop it. Meds didn’t help. I couldn’t sleep. By Sunday morning I was in agony. If I had a pair of pliers handy, I would have yanked the tooth out myself, novocaine be damned. Yes, emergency dental services! Off I scooted to the ER for help. Game of Thrones: Separated at Birth? Remember Spy magazine? It was a great journalistic read that folded way too soon in 1998. The other day I was thumbing through my old collection of Spys (a wistfully short stack) and came across a fascinating “lost” issue featuring the magazine’s famous “Separated at Birth?” column. And what do you know? I uncovered clear proof that Spy was way ahead of the curve when it came to investigative and historic reporting. As shown below, Spy astonishingly connected the genealogy of a trio of brilliant TV icons with their Game of Thrones ancestral twins. Kudos to you, Nostradamus Spy. Quick name a Superhero that’s had a movie. What immediately comes to mind is Superman, Spider-Man, X-Men, Iron Man, The Avengers, Green Lantern, Captain America, Ghost Rider, Hellboy, and The Incredible Hulk. And of course, there’s Batman, who doesn’t actually have superpowers but has plenty of tricks up his sleeve and he’s good enough to have a mega empire of comics and films. So let’s count him in. Anyone missing from that prestigious list?